Christmas time is coming to FiF UK! Let us cordially invite you to our very first, very special Christmas Evening to celebrate that magical time together. 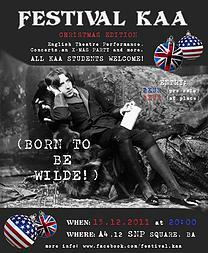 Students of the Department of English and American Studies have prepared a unique program for all of you. The theatre group will introduce their new play “The Potman Spoke Sooth”, a criminal comedy with absurd elements. The play will be followed by a musical performance by Andrej Urbanský (guitar), accompanied by an amazing singer, Andrea Kyslanová. After the program, complimentary refreshments prepared by the students of our department will be provided for the guests.